One of the hardest things I ever did was give myself permission to prosper. I know that sounds suspect because we all want to prosper, no? I was raised both in the United States and in Brazil and the thinking in these two countries for many is that success is evil. In fact, a lot of the people I know get annoyed because they hear someone has encountered or created prosperity in their lives. People who sat down and prayed with me when I was having a hard time financially, many abhor signs of financial success. This cultural error is so prevalent that it does affect me on a subconscious level. And what I did with that information for too many years is develop my own behavioral patterns that took down my own success, or short-circuited any effort toward that end. I didn’t want to be “culturally incorrect” and have people reject me. I can remember telling friends I got my computer on sale because I didn’t want them to know how much I really paid for it. I was talking to my kids about peer pressure, but not walking the talk myself! So trained with a guilt complex since a child, I had to find a way to end this mental handicap that was interfering with my blessings. I’m not talking about pride because when blessings come I know they are from the power and faithfulness of God. Yet accepting them when they came in, without being embarrassed for them, takes courage. And here’s how I unlearned the wrong behavior. It’s the truth in God’s Word instead of what Dave believes that others have to deal with. On this same thought, I changed a few of those friends – to spending more time with people who are not afraid of success. These people had faith and I will tell you when you get around people who have faith in a thing you get encouraged. I could finally see that God really wanted to bless me and provide for me. Other people have power in their ability to believe God for victory and provision in my life. Crazy? Well, I dug… Matthew 9:1-8 … Mark 2:1-12 … Luke 5:18-26 … there’s a guy who is paralyzed with palsy. 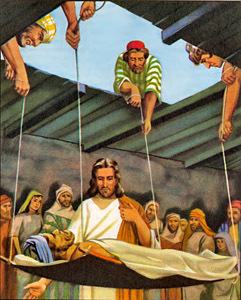 His buddies, people who care about him, bring him to Jesus and you’ve probably heard the story – they couldn’t get close to where Jesus was standing so they lifted his cot up to the roof, opened the tiles and lowered him down. Wow! What friends, no? Now, look at the scriptures and read what it says: It was the faith of the friends who Jesus responded to. The paralytic didn’t do anything! Get close to strong people of faith. I don’t mean crazy people or fanatics. I mean people who would do that kind of thing for you – lift you on a roof and lower you down because they wanted success so bad for you. P.S. Next, I want to tell you about how God promises to prosper you. It has everything to do with your spirit (love), and obedience (tithing).